This image makes me laugh when I view it. It has the layering element that photographers with a true journalistic approach strive for. 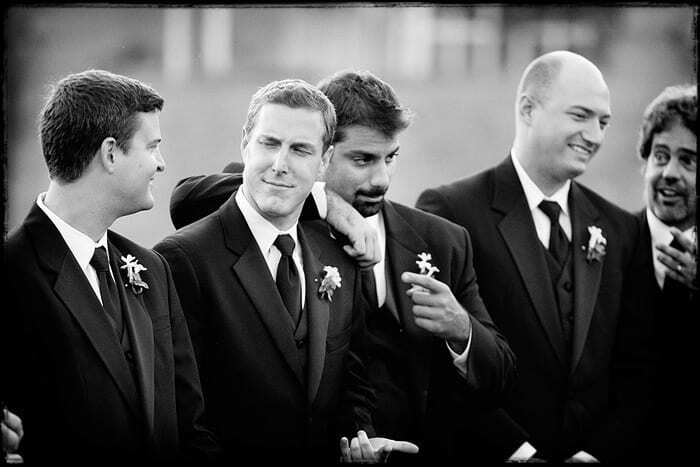 What I love about this moment is that every groomsman has a different expression, giving the photograph an interesting composition. The element of repeating shapes and patterns in the tuxedos and five distinctly different layers make this image work. In my opinion, these images make the wedding photography special and unique. I try to be aware of the not-so-obvious times to release the shutter and compose an image. These times give me my personal favorites and our clients most memorable images. They also give each wedding a unique flavor, capture personalities and quite frequently make our top selections for “One moment” features.